In an effort to get the golf ball into the air most golfers try to ‘lift’ or ‘scoop’ at the golf ball. You will likely find your right hand (right hander) dominates the downswing and comes underneath the left hand too quickly resulting in the scooping or lifting movement. This usually results in a thin or fat golf iron shot that lacks accuracy and distance. Two outcomes will usually happen and that’s a shot that flies over the back of the green into more trouble or it comes up way short and you’re faced with a 30 metre pitch or even a long range bunker shot. Neither one of these positions is desirable! What most golfers don’t realize is that the head of a golf iron is designed to be hit in a descending motion to promote optimum power and trajectory. So if you strike the ground first and then the ball in an upward motion, 9 times out of the 10 it will result in inconsistent contact. 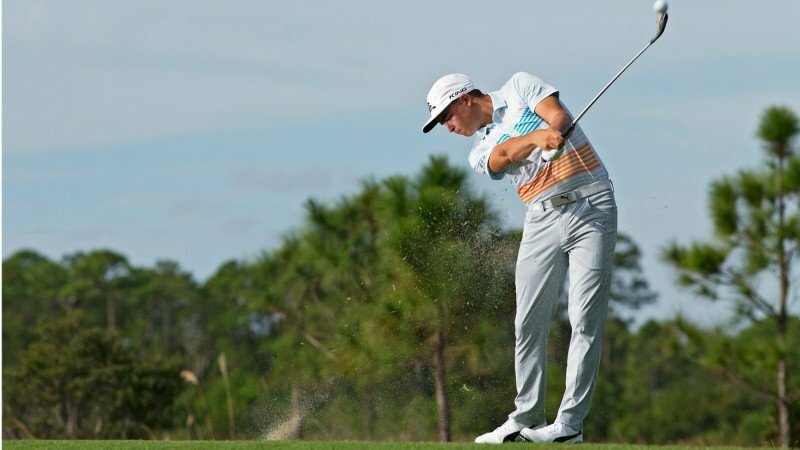 Ideally, you want to be hitting the golf ball first and then the ground which produces those penetrating golf shots you see the professionals hitting on television. Shift your weight to the front leg on the downswing with your leg and shoulder right on top of each other. Practice making half golf swings and work on getting the back of the left hand (right hander) facing towards the target when the clubhead makes contact with the golf ball. Hold the golf club predominantly with the bottom 3 fingers of the left hand. The right hand should just be lightly touching so it doesn’t push against the left and cause the golf club to flip upwards. 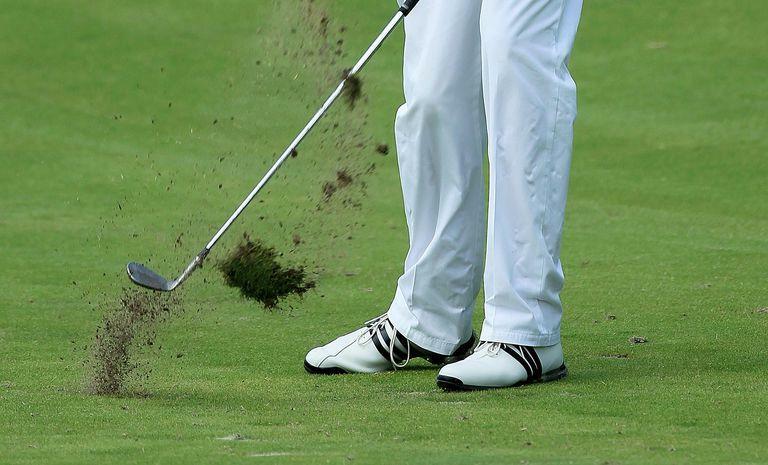 Post impact your left hand should naturally roll closed and your right hand will end up on top. Practice 200 repetitions to get the move ingrained in your muscle memory. Another great way to improve your striking of golf iron shots is to identify where you club is bottoming out in the swing arc. That means where is the clubhead striking the ground so that you can position the ball and yourself to ensure you’re in the best position to make solid contact with the golf ball.